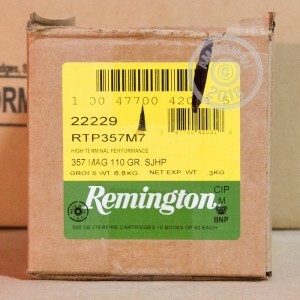 This .357 Magnum self-defense ammo from Remington is a hard-hitting yet affordable choice for your revolver. 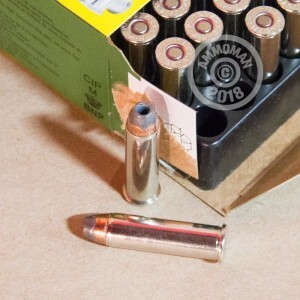 Packaged in convenient 50 round boxes, these cartridges fire a light 110 grain semi-jacketed hollow point bullet at nearly 1,300 feet per second. This combination delivers just the right amount of penetration and more than enough expansion! 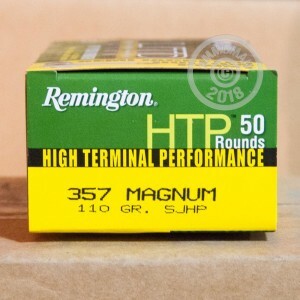 HTP ammo uses non-corrosive Boxer primers and nickel-plated brass cases. 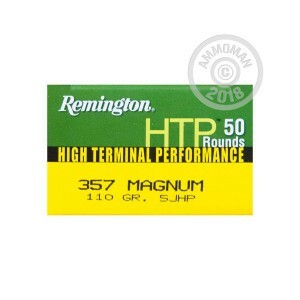 This 500 round case is perfect for some rigorous wheelgun practice and contains 10 boxes of 50 rounds each. Place an order for this case or any other items totaling $99 or more at AmmoMan.com to qualify for free shipping! I haven't had the opportunity to shoot it yet. Great price, no shipping fee and delivered ahead of schedule!